15 Free Spins and 100% Match Offer on NEW Realms Video Slot Promotion! Genesys Club’s new game, Realms, launched on the 27th of November 2015 and is already getting impressive feedback. The Game developed by Saucify is now live and playable in all 5 of the Genesys Club Casinos. Treasure Mile players will be in for a real treat with 15 Free Spins and 100% Match Bonus Offer up to $100. This is an ideal offer to try out this amazing new game. The offer is limited until 31 January 2016. Realms offers a visual and auditory extravaganza for players! If you like your video slot game action fast, fun and a feast for the eyes and ears then the new Realms Video Slot Promotion will take you to a different world altogether! This is a brand new video slot sporting double direction paylines and giving you the opportunity to experience fast paced fun and excitement filled with rainbow coloured animations and high energy soundtracks that will keep you glued to your screens! See all your winning lines indicated with an electrical orb of light and motion streaking across the screen as the soundtrack builds to a crescendo. The game offers stacked symbols! The rainbow Winged Jewel will be your guide as an expanding wild on reels 2 or 4. Expanding Wilds covering the remaining positions on reels 2 or 4 will complete any possible wins. The Black Sable (Sword Shield) will give you up to 8 free spins! Free Spins can be reactivated again during the feature game! 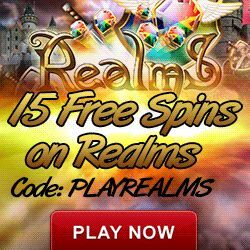 This game has got everything to keep players enthralled for hours, so get ready for a magical journey on Realms Video Slot and elevate your status by gathering the magical shields and rejoice as the angel announces the rewards of multiple wins. * All Offers are valid for 1 claim only at Treasure Mile Casino. * This promotion starts on 27 November 2015 and ends on 31 January 2016. Treasure Mile Casino is part of the Genesys Club Group of Casinos, which consists of 5 themed casinos, offering a unique and impressive selection of casino games. Players will be spoilt for choice with Video Slots, Classic Slots, Progressive Slots, Table Games, Roulette, Blackjack, Video Poker and an assortment of other types of games such as Scratch Cards and Keno.